It was only a matter of time. Less than a decade ago they started to miniaturize laptops to a whole new level. Then in the face of insurmountable smartphone and tablet demand, the mission was interrupted. But like a phoenix rising from its ashes, the second coming of netbooks was inevitable, and they’ve definitely come a long way. 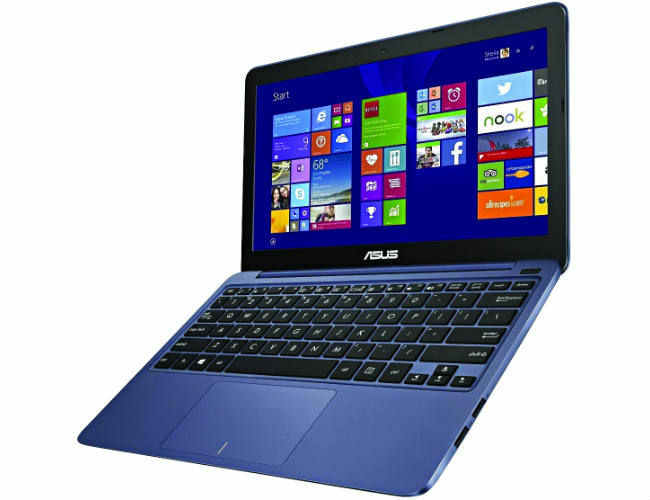 To begin with, they’re no longer referred to as netbooks anymore, just thin and light laptops. They’re no longer restricted to a 10-inch form factor, with almost all thin notebooks now gravitating to a 11-inch form factor. Their specifications, features and designs have also evolved with changing times – depending on your price budget, you can buy a 11-inch ultraportable for as little as 15k, for a touchscreen device you can spend anywhere between 20k to 30k, and for a 2-in-1 tablet-notebook hybrid the asking price is as low as 25k. The trend of shrinking laptop form factors finally being available at an affordable cost is a breath of fresh air, especially in the ultraportable laptop category – where traditionally OEMs tried to focus their efforts in the premium segment. That’s no longer the case. Another market reality adding to the growth of 11-inch laptops or 2-in-1s is the shrinking tablet space – tablet sales have seriously nose-dived over the past 18 months, and this has given manufacturers added impetus to refocus their energies on perfecting tiny laptops once again. If there’s one thing we realized from this comparison test, by looking at candidates from Acer, ASUS, Dell, HP and Lenovo, is that despite shrinking laptop dimensions, their hardware performance has marginally increased (as compared to the netbooks of old) but battery life has shrunk a bit – make no mistakes, this is still a lot better than mainstream 14 or 15 inch laptops. And in terms of design, the 11-inch laptop segment also has hybrid tablets on offer, so consumers are much better off in terms of choice than they ever were before. 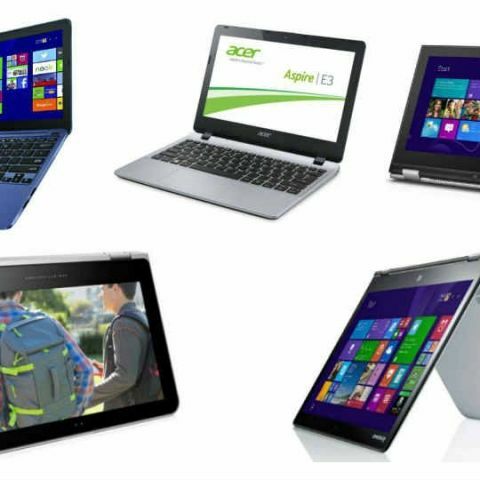 What do all these laptops we’ve compared have in common? They are all ultraportable, smaller than most laptops you’ve looked at all your life, they offer better battery life than larger-screened laptops, and some of them can double up as convertible tablets as well. What more do you want from fully functional laptops that weigh less than 1.5-kg apiece and cost significantly lesser than other mainstream notebooks out there? Find out more about the contenders and their individual highs and lows. Initial setup: We tested these 11 inch thin and light laptops much like any other laptop we benchmark. All laptops to be tested were first examined and everything about them is catalogued, including bundled software, accessories, etc. We then delete the antivirus and other ‘bloatware’ from the system to ensure minimal performance impact on the devices. Drivers and essential software are updated. Finally, the devices are set to run in performance mode in the BIOS as well as in the power options. All performance inhibitors are turned off, as much as possible – stuff like hard drive idling to sleep, screen switching off, screen dimming on battery mode, etc. After this, the laptops are ready to go into the grinder of our performance benchmarks. Performance tests: We conduct a whole series of tests on the devices to measure the impact of every aspect of the system on overall performance – tests that stress the laptop’s CPU, RAM, GPU, hard drive, screen, thermals, battery, and more. These tests include industry standard benchmarks including (and not limited to) Futuremark’s PCMark 8 and 3D Mark, MAXON Cinebench, and others. 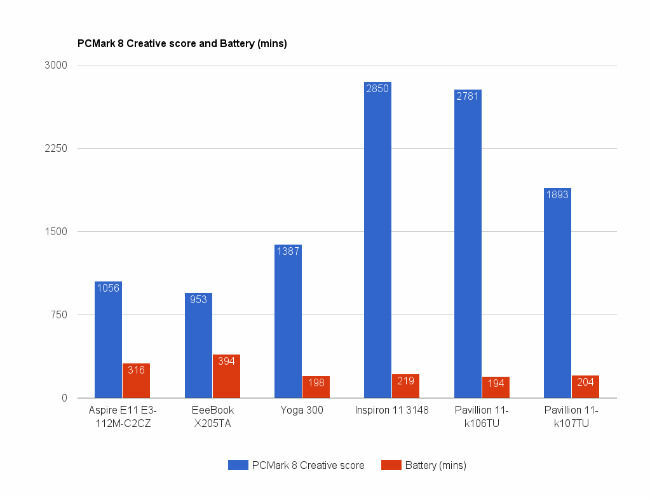 We use PCMark 8’s Creative test suite to evaluate battery life of each laptop, as well. Results are carefully catalogued. Screen brightness and contrast ratio is measured using the DataColor Spyder 4 Elite test unit – a color calibrator. It’s essential to calibrate all laptop displays before objectively testing them, and we do just that. In dark rooms with little or no ambient light, the laptops are tested with Datacolor Spyder Studio. Brightness and contrast is tested at different luminance level, and an average of multiple readings is taken as the final score. We also test the screen’s gradient through DisplayMate and Lagom.nl. A series of subjective testing is also conducted that scores aspects such as a laptop’s keyboard, touchpad, palmrest, screen readability, onboard speakers, look and feel, watching movies, playing games (if the laptop is meant for gaming), among others. These tests help complete the gamut of objective benchmarks with real-world test scenarios, allowing us to take a fairly homogeneous look at the laptop’s overall pros and cons. The final performance score is arrived at which includes the weighted sum of all the scores catalogued. Weights are assigned based on the perceived importance of the components. For example, since gaming doesn’t really matter or all that important on a business laptop, gaming benchmarks and scores from them are of lesser importance here than they would be on a home entertainment or gaming laptop. Stuff like battery life, screen brightness, CPU performance will be of significantly greater importance in a business setup. Features score: The features present in each laptop are tabulated and given weighted scores depending on perceived importance. For example, dedicated multimedia keys and volume keys are given more weightage than those that are shared with Fn keys. An important note on features, we don’t rate CPU, GPU, RAM characteristics any weight here, because we feel those characteristics already surface in the performance part of our testing. Example - Whether a laptop has a dual-core or quad-core laptop doesn’t get lesser or higher points because both of these laptop’s performances take those aspect into account. Features that directly impact performance are not counted or scored here. Design and Usability: The scores for this parameter are largely subjective as they indicate our experience with the device. Items such as quality of the keyboard, responsiveness of the touch-screen, etc. are weighted and scored. Final score: The final score that we arrive at is the sum of the performance, features and design scores with a variable individual weightage. This is not a fixed weightage, and depending on the category of laptops we’re testing, these weightages can be different. For this particular comparison, we gave performance, features, design and price 40%, 20%, 30% and 30%, respectively. A note on winners: The Best Buy laptop is awarded to the device with the best price to performance ratio based on a predetermined formula. This is the ideal, value for money product in the test. The Best Performer award is awarded to the device with the highest overall performance score. The Editor’s Pick award is awarded to the device that the reviewer feels is the best product that offers something extra or unique that none of the other laptops have. The Editor’s Pick is an entirely subjective award, the decision for which is based on the reviewer’s experience while testing the products. 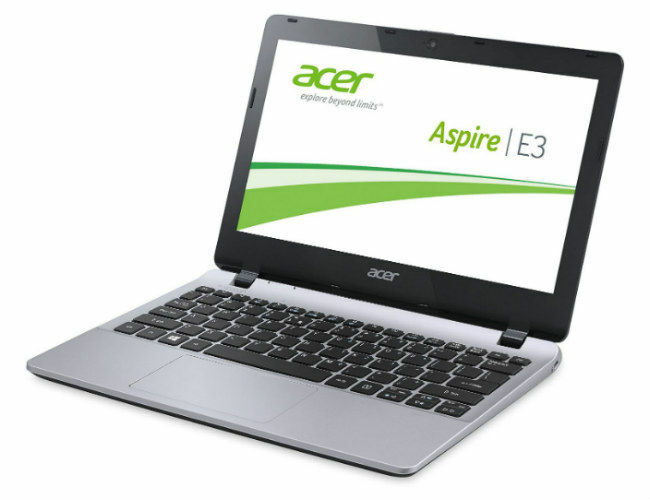 The Acer Aspire E3 112M is a decent example of the species. Its all-plastic shell is quite thin and the whole thing only weighs about 1.3 kg – extremely easy and convenient to ferry it around! It can easily disappear inside a backpack or a medium sized hand purse without anyone’s notice. Trudging the slim Acer notebook is no problem whatsoever, and its construction or build quality isn’t bad either but it isn’t spectacular – it does dip on the keyboard deck and its screen vibrates a bit too much while typing, but they’re nowhere close to a deal breaker. However, in the company of other better built notebooks, the Acer Aspire E3 112M doesn’t feel stellar. However, expectations need to be managed, as after all it’s the second most inexpensive machine in this comparison. Depending on how you look at it, one of the design aspects of the Acer Aspire E3 will either have you sing its praises or pull your hair out in frustration. We are referring here to the placement of almost all the ports on the back spine of the laptop. Except the SD card reader slot, earphone combo 3.5mm port on the left and the security slot on the right, all the USB, power, and Ethernet port are on the back side of the laptop and difficult to fiddle with while you’re in the blind. The first thing when we booted up this machine is the horde of pre-loaded applications which Acer had bundled with the laptop, which slows down the system quite a bit. More than its chiclet-sized keys, we like the Aspire E3’s large and wide touchpad. Its matte screen is a breath of fresh air to use, not suffering from reflection issues that plague most glossy screens on laptop these days. For someone who’s going to be looking at non-multimedia content on the Acer’s screen all day long, its matte screen is a true champion for that cause. Sound from the laptop’s speakers was good with very less distortion at upto 80% the volume, second only to the HP’s better-than-average B&O speakers. And its battery life is its only boast worthy highlight, we clocked over 5 hours on our benchmark, which easily translates to over 8-9 hours on a conservative power plan. This was second only to the ASUS EeeBook X205TA, so you know which notebook to pick if you desire one of the best battery performance we’ve seen in a 11-inch notebook this year. To re-emphasize, what we didn’t like on the Aspire E3 is all the preloaded software that slows down an already humble performer. After deleting quite a few unnecessary apps, the performance of the tiny, slim notebook did improve a bit, but it still doesn’t compare to some of the other laptops thrown into the mix of this comparison. Multitasking beyond two apps easily slows down this machine, and speed is clearly not its forte. If anyone should be buying this machine then it should be for its ultra portability and very good battery life. The lightest and thinnest laptops of the bunch we tested for this comparison test, the EeeBook’s a true featherweight at just under 1 kg – easy to carry around and work on. But compared to all the other higher-priced laptops in this comparison, this EeeBook isn’t the best built – its keyboard deck wobbles a bit too much while typing on its otherwise comfortable, isolated keys, and touchpad doesn’t inspire too much confidence either. The mouse buttons were extremely soft to press, though. Another limitation was the mini HDMI port, rather than a full sized HDMI port which would have been better. But it’s with its performance that the EeeBook X205TA redeems itself. It offers over 6 hrs of battery time in our synthetic, that’s easily over 9 to 10 hours on a conservative plan. And also its screen brightness and color gamut is very good at its price. Due to the 32 eMMC the user only gets 23GB of actual storage, and its 500GB of cloud storage is largely meaningless as it’s restricted by the speed of your Internet connection, and we’re aware of the poor Internet connectivity from the Indian context. Speakers were also average and its output was similar to the Lenovo which also has Dolby Digital. Watching movies, listening to music, working on a few basic apps, that’s all you can expect from the X205TA. And of course, exceptionally long battery life. One of the biggest highlights of this notebook is its truly inexpensive price. Its finish isn’t glossy so it doesn’t leave any fingerprints around, and it’s the lightest notebook in the mix with the best possible battery performance. Not a bad choice at all for someone who’s interested in spending less than 20k on a thin and light notebook to carry around while commuting in the city or a cash-strapped student who wants to invest in a laptop for use at college. This is definitely one of the machines worth recommending, and you’ll read more about it in our winner’s section towards the end of this write up. The design of the Dell is probably the best among all the convertible machines we received for this comparison. It has a silver aluminium coloured finish all around its screen lid, palmrest and bottom panel – it looks and feels premium, and certainly money well spent if you are easily swayed by good looking gadgets. Its overall build felt quite bulky, though, despite weighing just 1.4 kg. Open it up and you’re instantly drawn to its glossy screen, which apart from being quite good is also a huge fingerprint magnet. The Dell Inspiron 11 3148’s keyboard claims to be spill-proof with a chiclet-style key arrangement and it slightly bulges out at the center – we don’t know why. Is it supposed to aid typing inadvertently? Overall, the keyboard was very spacious and the palmrest area is also very comfortable due to the curved end. The exhaust heat vent position on the Dell Inspiron 11 3148 is very bad at the center near the hinges which tends to attract quite a bit of heat, and especially if you’re holding the notebook in tablet mode it becomes a little difficult to hold on to for long. 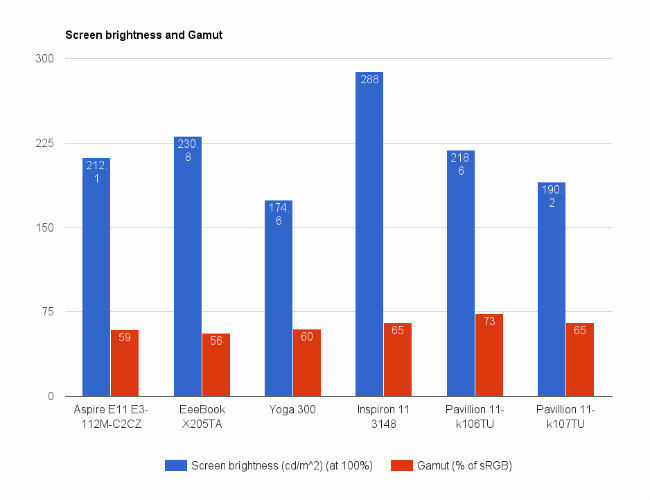 In terms of the touchscreen response and usability, the performance was fast but not so precise out of all the four notebooks that support tablet mode here. Another major gripe we had with the Inspiron 11 was the positioning of its power button couldn’t be any worse, as it’s located on the front edge, so you unintentionally press the power button without realising it. Dell also has a dedicated physical windows button, a rubber one at that too, placed just the lower side of the display on the hinge plate, which is very convenient. We also liked the small rubber strips placed around the keyboard deck to ensure the deck and palmrest doesn’t get scratched when you place the device in tablet mode – very good design. In terms of performance, the Dell easily outperformed every other machine in this comparison test, executing every task we threw at it with great aplomb. It’s obviously not meant for gaming and it can’t run 3D applications, but it’s a nice machine to use for day-to-day usage which offers 3 hours 40 minutes of battery backup on high performance mode – expect over 7 hours of battery life on a more conservative setting. It was a good 10-15% faster in all aspects of its overall performance compared to the rest of the competition. Out of the bunch of laptops we received for this comparison, we managed to get two almost identical 11-inch ultraportables from HP. Why do we say that? Because they look exactly the same, right down to the tee. 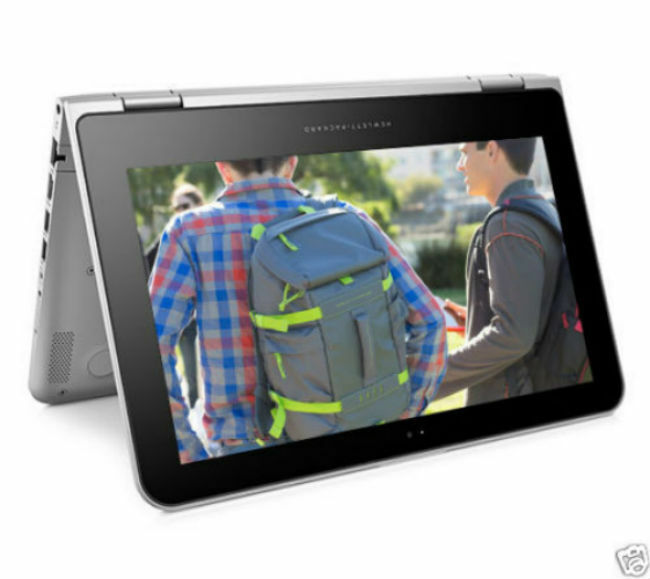 The design of the HP convertibles is a fusion between the Dell notebook in terms of its hinge and the Acer E3 a little. Both of them have silver grey premium exterior and black keyboard deck and screen bezel that houses a glossy display. If we keep them side by side they look exactly the same, and the minor differences only start to emerge when you look at its spec sheet (please refer to the table). Both the machines excel at audio performance, thanks to its superior Bang & Olufsen speaker housed inside them, that really hits the ball out of the park in terms of reinforcing your belief in the idea of betterthan-average audio off laptops in the coming years. The main difference between both the HP units lies in their processor and HDD capacity. The HP Pavilion 11-k106TU has the latest 6th gen Intel Core M3 6Y30, while the Pavilion 11-k107TU has an Intel Pentium N3700 model. And while one comes with 500GB of internal storage, the other packs in a whopping 1TB – not bad at all for an 11-inch form factor ultraportable notebook. The HP Pavilion 11-k106TU screen brightness and the colour reproduction was better compared to the Pavilion 11-k107TU, which dulled a bit on side by side comparison. So after turning on the laptops the first thing that pops out is the HP Assist registration which is a bit annoying and would come up every time you turn on the laptop screen. We really liked the placement of the Windows button on the Dell machine which was very favourably positioned (at the centre of its bottom screen bezel), but the Windows button in the HP model requires a little getting used to as it is placed on the right side, a very inconvenient position to place the button which takes some getting used. There is no vents in these laptops, but the heat output from the heat patch is too much in the Pavillion 11-k107TU, making it too difficult to work on while keeping on the lap. But that’s about the only gripes we have with both the HP machines. Also unlike the Dell Inspiron 11, the touchscreen experience was very precise in the tablet mode on both the HP Pavilion 11 notebooks. During sound comparison the Bang & Olufsen speakers really proved to be best in the bunch. Entertainment and other activities went off pretty well on the HP machines, and even their battery life is pretty good. If you have the money to purchase them, we definitely recommend the HP laptops as they’re well worth the money – especially the Pavilion 11-k106TU which comes with the latest 6th generation Intel Core M processor. You’re definitely getting your money’s worth here, especially as both the HP machines also double up as convertible tablets with very good touchscreen feedback. 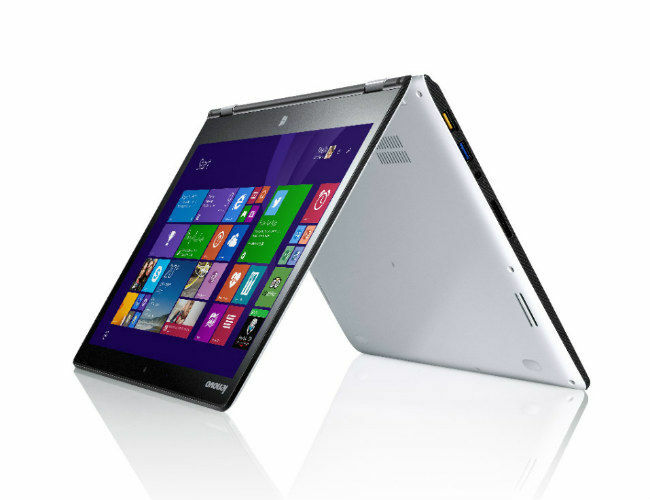 Out of the box, the Lenovo YOGA hybrid notebook looks pleasing on the eye and feels tightly packed together. 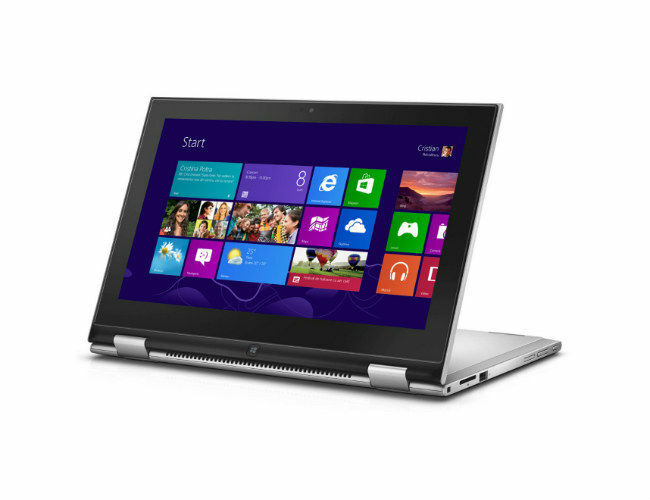 Unlike the Dells and the HPs, the YOGA 300 doesn’t appear to be a class apart just by looking at it. The two parts of the hybrid laptop are held together by a solid metal hinge, which lets the screen lid and bottom panel rotate up to 360 degrees without feeling anxious or fearful – the build quality exudes a lot of confidence. Even though it’s less than 1.5kg in weight, the YOGA 300 feels a touch bulky. It maybe due to the excessively curvy seashell design of the laptop. As is the case with many Lenovo laptops through the years, the YOGA 300 excels and remains unmatched in terms of input devices. Its curved keys are a joy to type on and the trackpad feels rock solid. Its touch screen is precise in the tablet mode unlike the Dell’s. A unique feature among the host of buttons provided on this laptop is the accompaniment of a dedicated key to reset, next to the power and volume rocker which starts the Windows recovery launcher. The sound quality wasn’t as good on the YOGA 300 as compared to some of the HPs and other laptops in this comparison. Even at 50% volume the sound from the speakers got distorted when playing heavy metals. But we encountered a bunch of good pre-loaded software on the Lenovo YOGA 300 – phone companion, management, etc – which was a thoughtful addition. Unlike the Acer preloaded apps which slowed the processing, this one didn’t and actually proved useful, especially with phone companion to access mobile devices easily. For its overall impressive performance, the Dell Inspiron 11 won the Best Performer Award, and the HP Pavilion 11-k106TU gave it a very good run for its money, finishing up almost equal in terms of score. But the Dell was the fastest overall in terms of CPU performance, had the brightest screen, highest screen readability score, and lowest operating temperature at full load. A deserved winner. The ASUS EeeBook X205TA is a very good deal at its price, edging out the Acer Aspire E3-112M by winning the price war and the Best Buy Award. It was slightly better than the Acer in terms of performance and build quality and sold for 25% cheaper. The HP Pavilion 11-k107TU won our Editor’s Pick Award, closely edging out the Lenovo YOGA 300 for largely offering better audio performance than the YOGA and doing a generally very good in most departments, performing way better than its Lenovo competitor.